An authentic dog star in the Disney galaxy, Pluto has been “best in show” ever since he first sniffed out stardom in 1930. Walt was inspired to create Disney’s top dog by remembering the personable pooches he met while living on the farm in his childhood home of Marceline, Missouri. 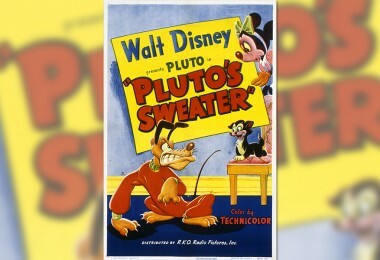 Ever since Pluto has, as Walt put it, been “working hard and trying, but usually not succeeding, in staying out of trouble.” In celebration of Mickey’s pal Pluto during these dog days of summer, we’ve dug up ten fascinating facts about everyone’s favorite fido. “Back in the early ’30s, we were doing a story where Mickey Mouse escaped from a chain gang,” Walt Disney explained, referring to The Chain Gang (1930). “We needed a bloodhound. Pluto got the part and turned out so well, we used him twice.” Yes, there were two bloodhounds in what is considered to be Pluto’s first film. 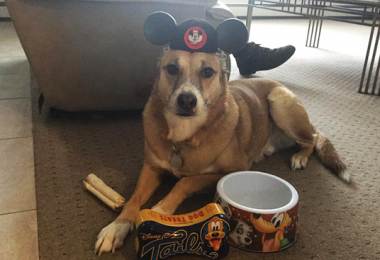 These “blood brothers” so pleased Walt that he decided to cast this canine as a fully licensed member for Mickey’s stable—make that kennel—of stars. 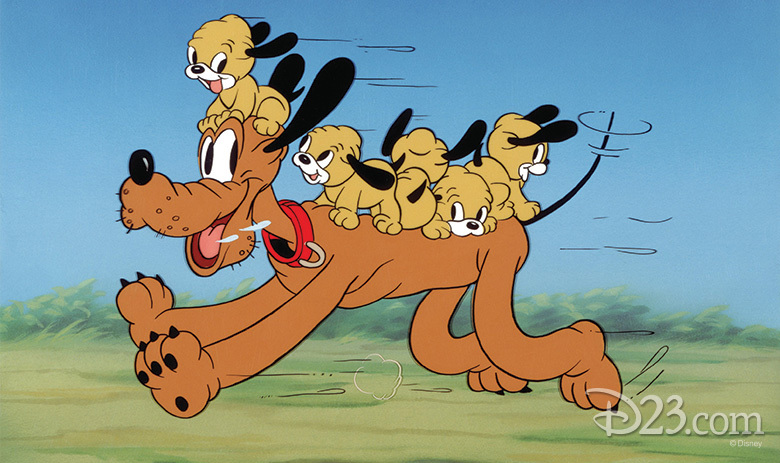 For one of the world’s most famous dogs, Pluto started out with a dizzying variety of identities. After The Chain Gang, Pluto popped up in his rightful role as household pet in The Picnic (1930)—but he was named Rover and belonged not to Mickey but to Minnie. 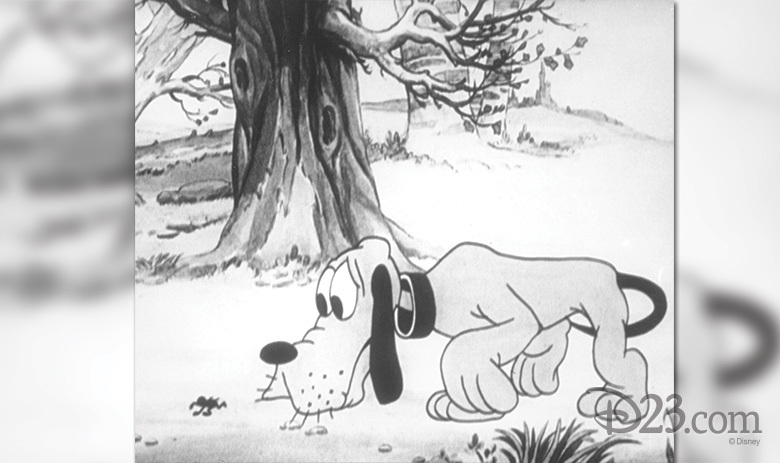 Finally, in his third film, The Moose Hunt (1931), the hound found a firmly entrenched place as Mickey’s pet. To name the Mouse’s trusty companion, Walt doggedly dug through many mutt-worthy monikers, including Pal and Homer the Hound. 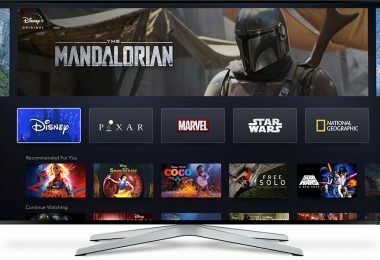 Finally, most likely in honor of the headline-grabbing newly discovered planet, and certainly with an eye to alliteration, the imaginative producer decided on Pluto the Pup. 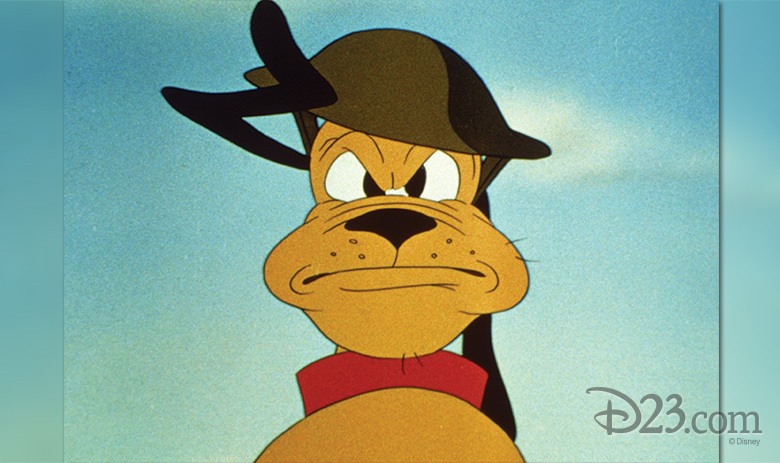 Pluto is a pantomime character; his animators express the pooch’s personality through pure action. However, audiences actually heard Pluto speak in The Moose Hunt (1931), wherein the pooch actually said, “Kiss me!” to Mickey. This one-off gag was not repeated, as it interfered with personality for the sake of an easy laugh. 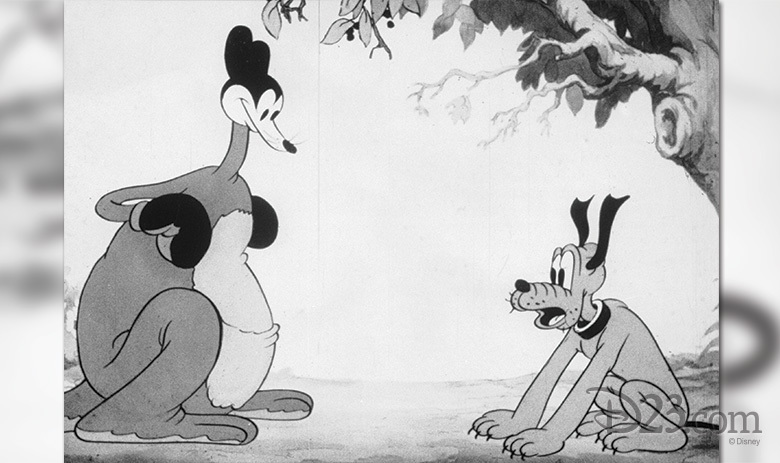 Another vocal experiment came in Mickey’s Kangaroo (1935), wherein the inner thoughts of the otherwise mute mutt are voiced. Pluto even crooned (with the help of a hidden record player) “You Belong to My Heart” from The Three Caballeros (1945) in Pluto’s Blue Note (1947). But overall, any Pluto dialogue has been mere doggerel, for as veteran Pluto animator Nick Nichols explained, “We’ve generally kept Pluto all dog…. He doesn’t speak, except for a breathy ‘Yeah! 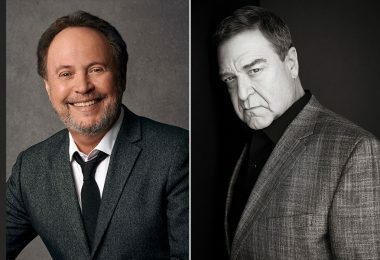 Yeah!’ and a panting, raspy kind of laugh.” Disney Legend Pinto Colvig, the original voice of Disney’s other dog star, Goofy, performed most of Pluto’s woofs, yaps, and yelps. Today, another Disney Legend, Bill Farmer, carries on the vocal tradition, speaking for Goofy and barking for Pluto. 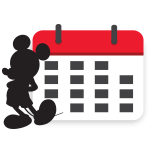 Mickey may have been the first cartoon character to convey personality, but his loyal pet was the original onscreen thinker. Master animator and Disney Legend Norm “Fergy” Ferguson created a milestone in character animation with the famed flypaper sequence Fergy animated for Playful Pluto (1934). (You can see Fergy animate Pluto in the behind-the-scenes feature The Reluctant Dragon, 1941). The unforgettable sequence—Pluto unknowingly sits on a sheet of flypaper leading to a sticky string of hilarious gags as he attempts to figure out what’s wrong and how to free himself, marked one of the first times an animated character appeared to actually be thinking. 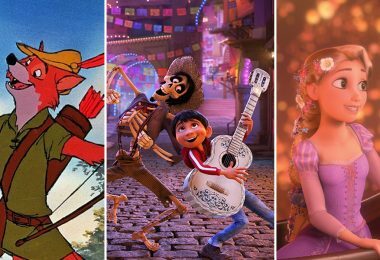 Disney Legend and master animator Frank Thomas noted, “This was the key to making a believable character—getting the character to think and puzzle out a situation. Pluto was ideal for this.” For this groundbreaking scene, “so much depended on the building up of the situation and the pauses for Pluto to think about the different ways to get rid of the flypaper,” Fergy explained. “Good expressions were necessary… to build the gag or situation to a climax… The animator has to feel the situation himself.” So priceless was the flypaper sequence that Walt had it reshot in color in Beach Picnic (1938). A romantic at heart, Pluto is most often portrayed as a bowser bachelor, falling for such canine cuties as Fifi the Pekinese or Dinah the dachshund. But Pluto’s Quin-Puplets (1937)—the first animated short officially starring Pluto—was cleverly created in the wake of the 1930s craze kicked up by the celebrated Dionne quintuplets: Pluto and Fifi are seen as “Mr. And Mrs. Pluto,” the parents of five mischievous mini-Plutos. 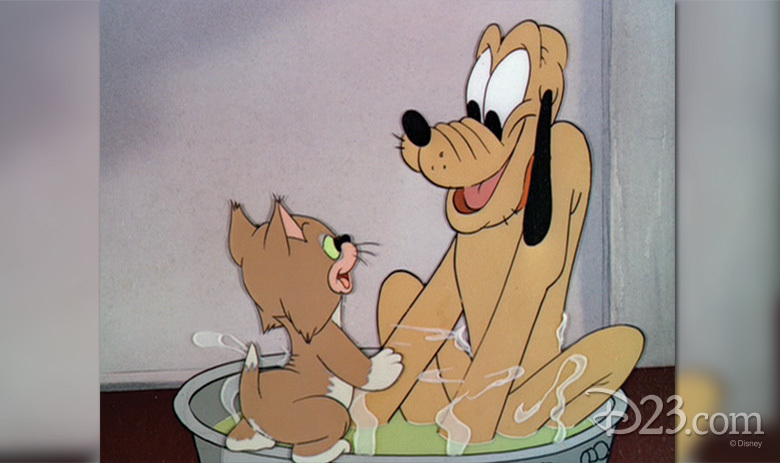 Pluto was also seen as the doggie daddy of a pup who followed in his pop’s paw prints in Pluto, Junior (1942), while even more of this fido’s family was revealed with a little guy named K.B. in Pluto’s Kid Brother (1946). 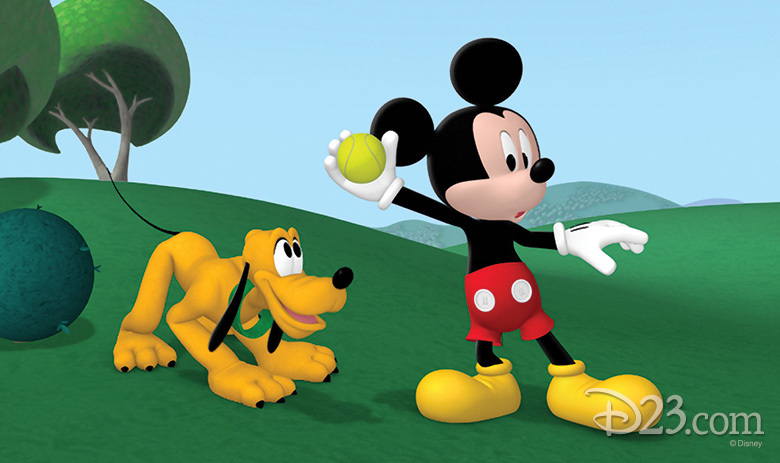 The fun-loving fido starred in 48 official cartoons of his own, but Pluto is in a good number of Mickey Mouse cartoons in which the scene-stealing hound is actually the star, including Pluto’s Party (1952) and The Simple Things (1953). Additionally, Walt made pairing Pluto up with Donald Duck a pet project as he felt that Pluto’s pet’s-eye POV worked well with Donald’s bombastic temper. The first Duck-and-dog show was the aptly titled Donald and Pluto (1936), with other examples being Donald’s Dog Laundry (1940) and The Eyes Have It (1945). 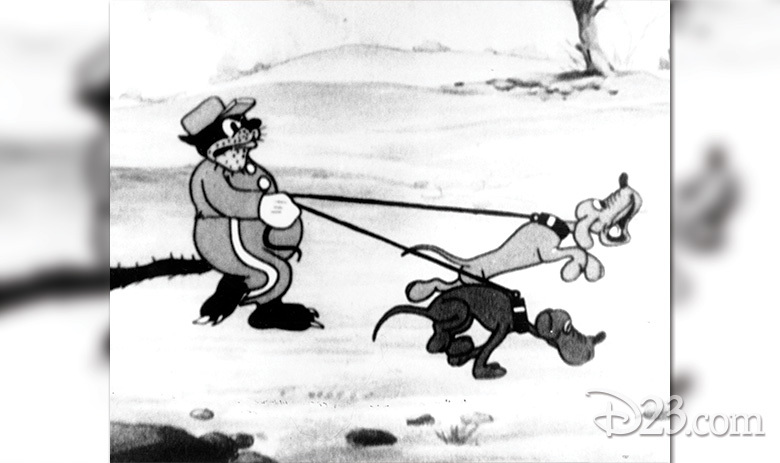 And the sometimes-foolhardy hound was the one and only member of Mickey’s gang to star in his very own Silly Symphony cartoon, Mother Pluto (1936). Pluto is a worldwide favorite in the comics. Aside from eagerly popping up in the Mickey Mouse comic strip from 1931 on, Pluto the Pup was showcased in the Silly Symphony Sunday comic page beginning in 1939. (In a meta moment for the lovable mutt, Pluto peruses his own Sunday comic page in A Gentleman’s Gentleman, 1941). The first Disney comic publication to feature original material just happened to star our pioneering pooch: Pluto Saves the Ship was originally printed in 1942, co-written by comic book maestro and Disney Legend Carl Barks. 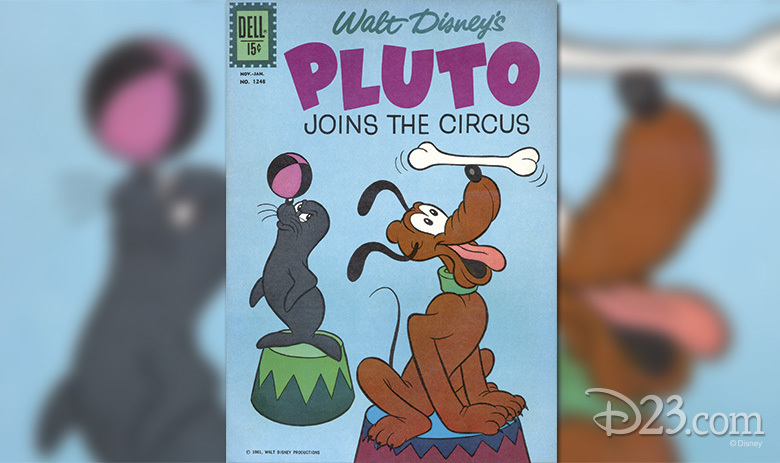 Always a good boy, Pluto was rewarded with his own comic book starting in 1952, including such elaborate graphic novels as Pluto Joins The Circus (October 1961), a 30-page epic drawn by Mickey-and-Pluto master Paul Murry. These panel-by-panel exploits of the accident-prone pup have been published all over the world in a multitude of languages, including Italian, German, Swedish, and Greek. 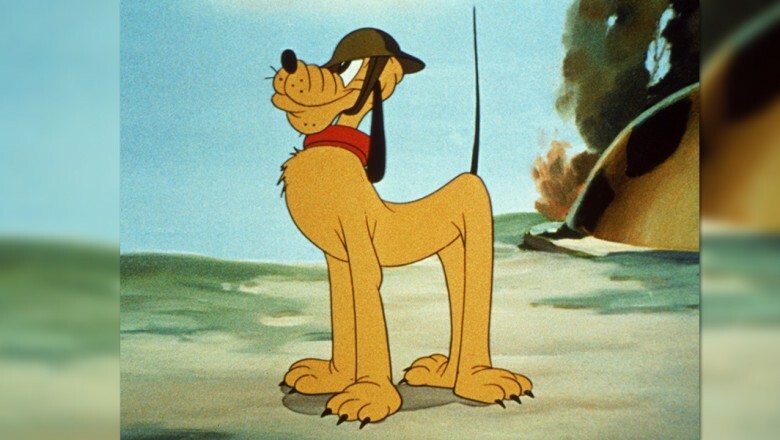 In 1942, Walt Disney said, Pluto “was presented with the Tailwagger’s own Academy Award®, the Boscar, for being the most promising dog actor of the year, a supreme honor for achievement in dog circles. 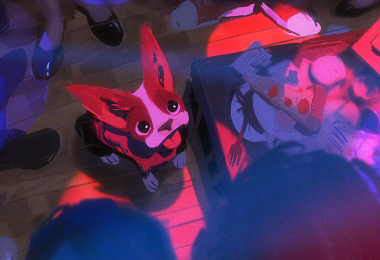 His fellow artists in the human acting profession made it a grand slam when they awarded this same Boscar-winning movie the motion picture Academy Award for the year.” The great showman (and dog-lover) refers to Lend A Paw, which indeed won the Oscar for Best Cartoon. The opening titles carry a unique and man’s-best-friend-worthy inscription: “This picture is dedicated to the Tailwagger Foundation in recognition of its work in lending a paw to man’s animal friends.” The Tailwaggers Foundation funds qualified nonprofit organizations that aid sick animals to which Walt Disney was a generous donor—a fact that undoubtedly made Pluto’s tail wag, indeed.